Stay engaged through hands-on group activities! Our education team is led by Scott Norman, who has flown over 1,000 Challenger Learning Center missions. He is joined by two Muscogee County School District educators who bring over 75 years of classroom experience. We match many of our activities, including Omnisphere shows, with the Georgia Standards of Excellence. Whether in Alabama, Georgia or Florida, do not hesitate to ask us about the standard(s) you hope to meet during your visit. The Education Department is a cornerstone of CCSSC programming, offering a skilled and motivated staff ready to engage with your class, tour group, corporate team, reunion etc! Explore specific opportunities here. The CCSSC is well versed in creating custom experiences for your group: from a two-hour visit for 15 adults to a full day experience for 120 students! 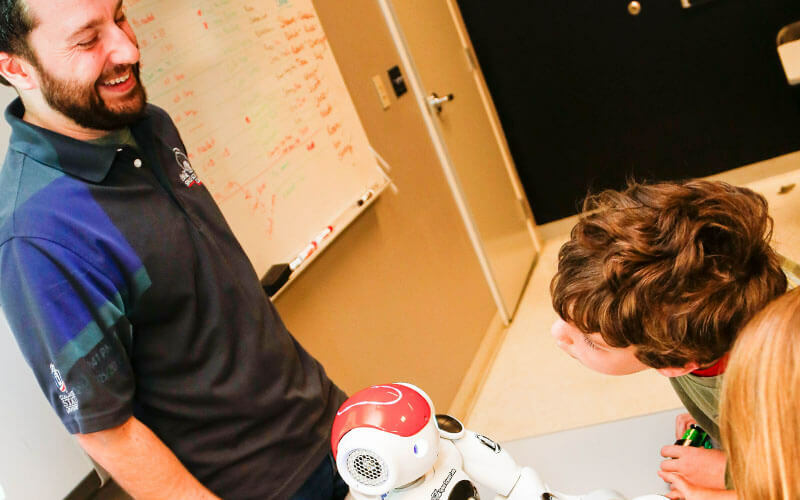 The CCSSC is home to the only Challenger Learning Center (CLC) in the state of Georgia, an immersive experience that takes astronauts to the Moon or Mars. Great experience for adult groups! For groups of 18 or more (min age of 11yrs). The External Program team offers a mobile planetarium program, telescopes nights and hands-on activities. 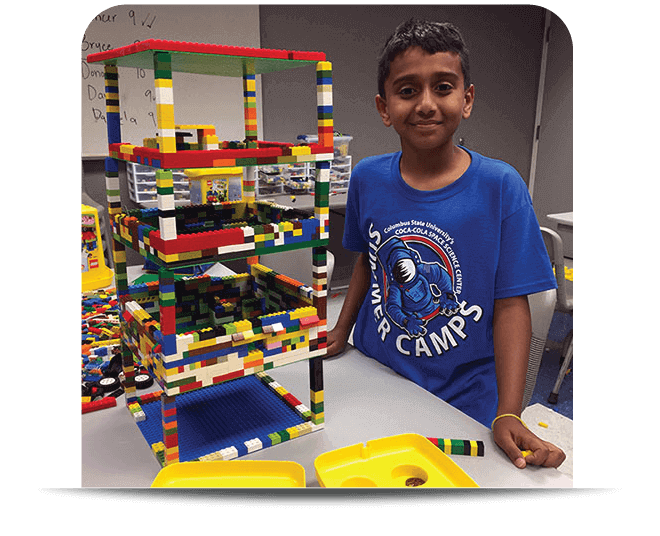 Don’t forget to check out summer programs that train students on science and engineering concepts through activities such as LEGO engineering, robotics & 3D design. The Challenger Learning Center offers engaging simulated space missions for groups of 18 to 30 people. An interactive experience that engages communication skills and teamwork to ensure a successful mission. Can’t come to us? We can come to you with a variety of programming including a digital mobile planetarium, day and night telescope observing, and add-on activities! Please review this mobile flyer and contact us for a booking. Pricing will vary based on activities chosen, travel requirements and staffing needs. Matthew Bartow (pictured with RED to the left) is the primary educator for External Programs. He has been a part of the CCSSC family for many years, from volunteering as a teenager on Astronomy Nights to working part-time, and now a full-time educator! Below are offerings of educational experiences based on recommended levels from Kindergarten to adults. Activity offerings available in multiple levels are adjusted to meet the needs of the group. Secret of the Cardboard Rocket: Come join a brother and sister as they build a very special rocket ship and travel throughout the solar system with a most knowledgeable friend. Movin’ Around: Students will participate in a class discussion about the planets and then create a model of the movements of the Earth, Sun and Moon using paper replicas, which they can then take home. Solar System Coloring Book: This Activity will give our youngest stargazer a take-home educational book of the planets with key information and facts. Earth, Moon & Sun: Coyote has a razor-sharp wit, but he’s a little confused about what he sees in the sky. Join this amusing character (adapted from American Indian traditions) in a fast-paced and fun show exploring moon phases, eclipses and more! Rotor Motors: Students will learn the basics of Helicopter aerodynamics and will build their own paper helicopters. Wristwatch Sundials: Students learn about one of the oldest time keeping devices and its relationship to the sun. Keepsake wristwatch sundials will be constructed during this fun activity. Black Holes: A “Black Hole” is one of the most mystifying, awe-inspiring events in the universe. With stunning visual effects, we explore where they come from, how they are formed and where they go. Narrated by Star Trek’s own John de Lancie. Seven Wonders: Turn back the pages of time and witness the ancient wonders of the world as they have not been seen for thousands of years. Then explore the seven natural wonders of the universe. Stars of Pharaohs: Voyage back in time to ancient Egypt and unlock the mysteries of the Pyramids. Learn how the Ancient Egyptians used the stars in their everyday lives. Enjoy stunning visual effects that take you into the heart of the temples and ruins of ancient Egypt. Two Small Pieces of Glass – The Amazing Telescope: A special show tracing the history of the telescope from Galileo to the launch of NASA’s Hubble space telescope. It explores the wonder and discovery made by astronomers throughout the last 400 years. Universe: Travel back to the beginning of the Universe and explore the wonders that abound in the Cosmos. Trace your steps back to our Solar System and learn what secrets the “Universe” holds. Features state of the art visual effects. Wonders of the Universe: With the use of the Hubble Space Telescope, view images of Nebula, Stars, Galaxies and the other beautiful wonders photographed by this unique astronomical platform. NASA Artifact Tour: Students are guided around the Exhibit Gallery and learn more about the many NASA artifacts housed within the CCSSC from one of our staff members. Origami Pinwheel Galaxies: Students will participate in a discussion on galaxies and the Hubble space telescope. Students will observe photographs taken by the Hubble that show various types of galaxies and their structure. Students will then construct a spiral “galaxy” using origami paper. Planetary Actions: Students explore the order and characteristics of the planets and will construct a model that shows the length of each planet’s year. Scavenger Hunt: Student teams will participate in a Scavenger Hunt to locate information on the exhibits, displays and the computers located in the Exhibit Gallery area of the Space Science Center. Star Clocks: Student will learn about constellations and construct star clocks. The star clocks are planispheres designed to allow students to navigate through the night sky with an accurate location of specific constellations. Geo Lab: Students will identify rock samples by analyzing physical properties (including color, hardness, appearance, etc.). They will record physical data and use that data with a dichotomous key to identify at least ten rock samples. Students will participate in a discussion of facts including the rock cycle, three basic types of rocks, etc. Introduction of various types of meteorites in included in this activity. Mars 1001: Space reporter Miles O’Brien guides you through a futuristic look at a daring 1001-day voyage to the planet Mars and back by an international team of space explorers. 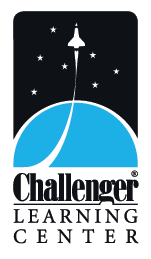 Challenger Learning Center Mission: An interactive experience that engages communication skills and teamwork to ensure a successful mission to the Moon or to Mars. *This is a unique experience and costs $500. * Learn more. Extremopatch: Students will participate in a presentation about astrobiology and extremophiles. Extremophiles are organisms that have adapted to extreme conditions or environments. Some extremophiles, such as tardigrades, have even flown in space. Students will create their own space mission patch that is representative of a possible astrobiology mission. Astrocyclus: The Astrocyclus will be constructed and serve as a model to compare and contrast the internal structure of the Earth, the Moon and the Sun. It will also demonstrate several different types of polyhedrons (triangles, tetrahedrons, and hexahedrons).